This month’s Virtual Book Club for Kids author is Tomi dePaola. 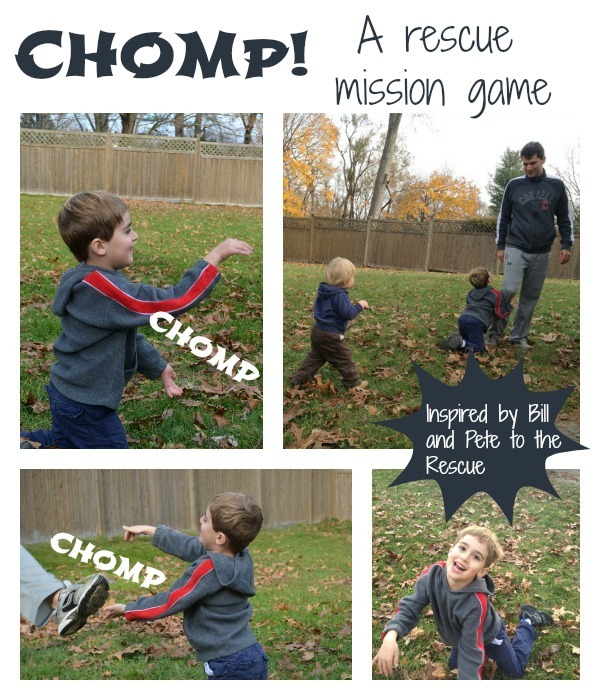 We read lots of his books, but for our activity we are going to share one inspired by Bill and Pete To The Rescue . We started playing this game after we read the book last month, and my boys still play the game almost daily. The book centers around Bill, a crocodile, and Pete, a bird who is Bill’s best friend and toothbrush. The friends set off to rescue Bill’s cousin,, Jane, after exotic animal poachers captured her from the Nile and brought her to the US. With the help of alligators from the Louisiana bayou, Bill and Pete rescue Jane. It turns out there are additional animals in need of rescue, including one close to Bill’s heart. Our favorite scene is when Bill and Pete and the alligators storm in to rescue Jane. Bill and his gator friends nip at the poacher’s pants, ripping some pant legs, and taking some pants off entirely. This scene is the center of our game. We reenact it. One of us is a poacher, and the others are Bill and the gators. The reptiles crawl around on the ground, chasing the poacher. When the reptile gets close to the gator, he sits up and stretches out his arms in a scissor-like motion to “chomp” at the poacher. Both my 4 1/2 year old and my 16 month old love this game. My 4 1/2 year old keeps trying to convince me that the 16 month old should ride on him the way that Pete rides on Bill, but I think we’ll skip that part for the time being! What is your favorite Tomi dePaolo book? Disclosure: Amazon affiliate links are used in this post. We borrowed this book from the library. But if you decide to go the Amazon route, and use this link, I’ll receive some cents (no additional cost to you).